Less than a week now until Christmas Day and as usual I’m running around like a maniac trying to finish off my shopping and make a start on the dreaded wrapping. 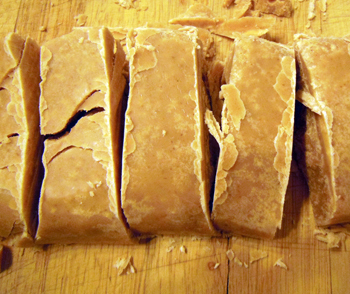 And, as is tradition in our house, we have to put aside one evening in the week before Christmas for fudge making. My husband dreads the day because it involves some serious physical labour (in the form of furious hand mixing which never fails to give you a dead arm). That said, this recipe is worth the effort because it’s an absolute godsend – the perfect present for those hard-to-buy-for uncles, fathers, brothers-in-laws and (if you want to be a creep) teachers. 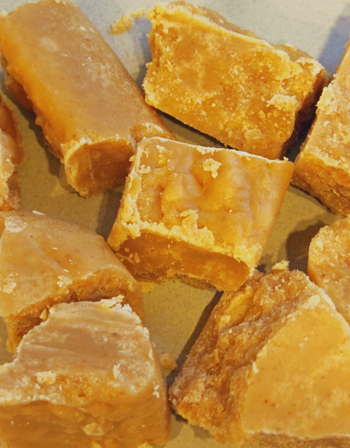 Whilst I call this recipe fudge it is really more like Scots tablet. 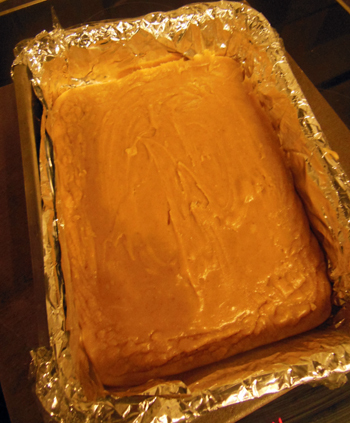 It is not soft and chewy like a lot of fudge but has a grainy texture with a slight bite and it melts just wonderfully in your mouth. You will need a large aluminium pot with high sides. Mine is from Ikea. 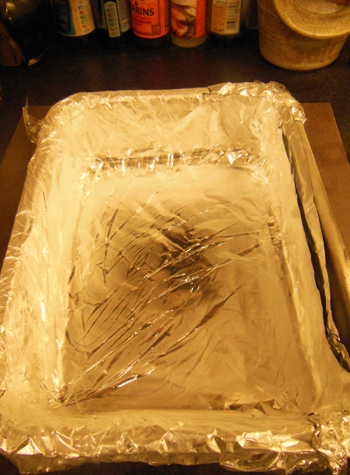 Line a baking tin (18 x 27 cm, or one with the same area) with tin foil and then cling film and place in the freezer for a few hours or overnight. Put the milk and butter into the pan and melt over a medium heat. Add the sugar and stir to dissolve. When the sugar has dissolved turn the heat up and when it is beginning to simmer add the condensed milk. Stir the mixture continuously with a wooden spoon while you simmer for about 9-10 minutes or until the mixture turns a light amber colour. I do this on instinct but there is a sugar thermometer on my Christmas list so that next year I can check that it has reached 116oC. 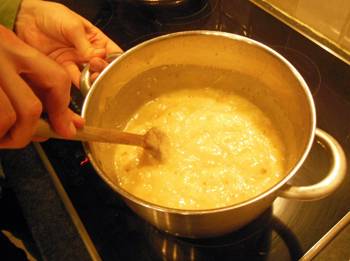 Now for the laborious part – remove the mixture from the heat and place on a damp cloth. Beat with a wooden spoon until the mixture starts to lighten in colour and thicken up. 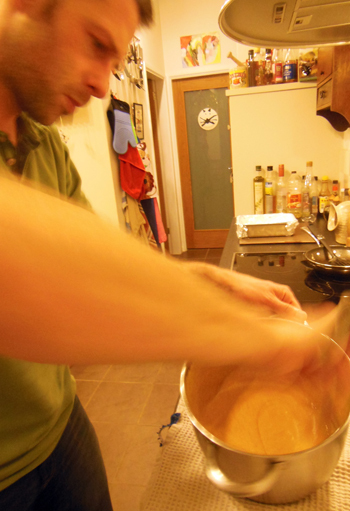 You need to be able to pour the mix into the tin so don’t let it thicken up too much. This usually takes about 5 minutes and you will need a team mate to help you mix in relays otherwise your arm will fall off. Pour the mix into your lined and frozen tin. Leave to cool at room temperature and then place in the fridge until set. To cut up the fudge you will need a really sharp knife. Aim for neat squares but in reality the brittle texture means you will get shards of all different sizes and lots of crumbs (save the crumbs – they are delicious on ice cream or just spooned directly into your mouth when you need a sugar rush to get through the Christmas chaos). 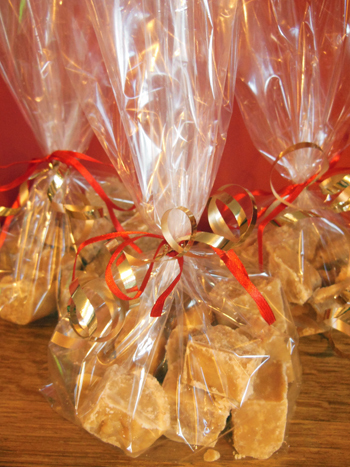 I put my fudge in clear presentation bags (from Lakeland) and tie with some Christmas coloured ribbon. I then store in the fridge until ready to give away and have to try very hard not to steal a piece or two. NOTE: The hazardous boiling of sugar means that this is not one to get young children involved in. Mine however will very happily eat it. Boiling the fudge mix. Make sure you stir continuously otherwise it will catch on the bottom of the pan. Remove the fudge from the heat and beat until it thickens. This is my slave/husband vigorously stirring. The prepared tin lined with foil and clingfilm. Fudge cooling before going in the fridge.